As the new school year approaches many of us are trying to figure out what to do with the 100s of papers that our kids bring home from school. 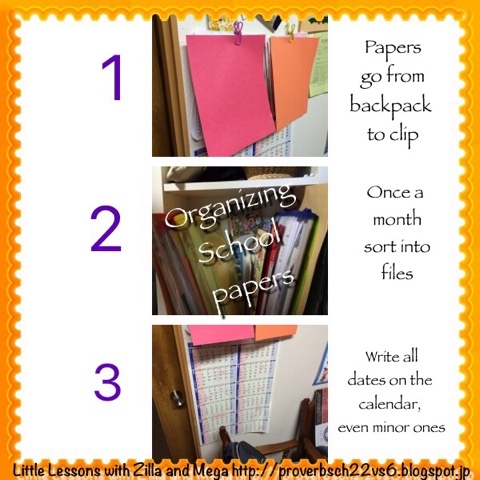 Whether you are just starting the school journey, or looking to rework your current organization system, it can't hurt to get a few more ideas! Over the past few years we have developed a filing system that works well, most of the time. There have only been a few misplaced papers this year so I feel like we've finally figured it out. 1. When the kids come home the first thing they do is empty their bags - bentos to the sink, papers to a parent, dirty things to the laundry, etc. The parent's job is to read the notices right away, highlighting important information, and then pin up the papers on the wall. If there isn't time to read them the papers go straight to the wall. Each child has a separate clip. The monthly class calendar stays at the top of the pile for quick reference. The school year calendar is at the back of the pile, also for quick reference. The papers are kept in a high traffic area so they are within easy reach. 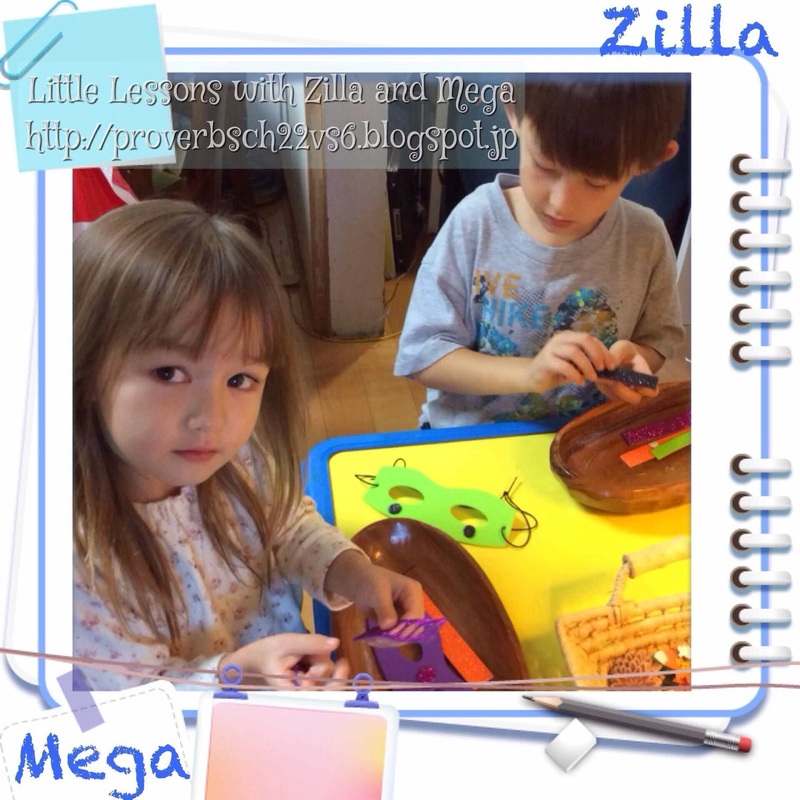 The kids each have a zipped file folder for complete homework, worksheets, art projects etc. so those papers go straight to their "completed work" folder and onto the files shelf. 2. About once a month we go through the hanging papers and move the old ones to a zipped file folder - again, one for each child. If you have more than one kid color coding the clip and file is helpful. As a general guide when we get a new monthly calendar it is time to move the notices from the past month into storage. 3. Family calendar - having a printed out calendar where the kids can see it will help them to know what is going on. Use it for keeping track of everything, even small things like when a survey needs to go back to school. As the kids learn to read & write they can help by checking it or adding to it on their own. We also keep a shareddigital family calendar with information the parents need. Another helpful thing is to have a shared photo album for the parents which is specifically for photos of important notices. This serves both as a back-up and easy reference when we aren't at home. These are the three main things that have made a big difference over the past couple of years. One other thing we do if have a file box with school handbooks, class lists and other essential info. This box is near the other files so it is handy but separate so it is easy to find the handbook in a rush. During the first year in particular we refer to it often to answer questions that come up. At the end of a year I sit down and go through both the school notices file and the homework file, taking out anything that is obviously not needed any longer. Questionable things go into a regular clear file for the following year. Sometimes having the past year's program for a school event can come in handy when making plans for the current year. Also, old kanji review tests can be helpful when studying for kanji tests. If you have an organization system for school papers that works for your family please share it in the comments section!